The past couple days the girls have been talking about snow. Even the smallest dusting gets them excited. What can you really do with just a little snow? Most of the things kids want to do in the snow like snowball fights and building snowmen and even sledding don't work without a decent amount of snow. Plus littler kids can't do all that. 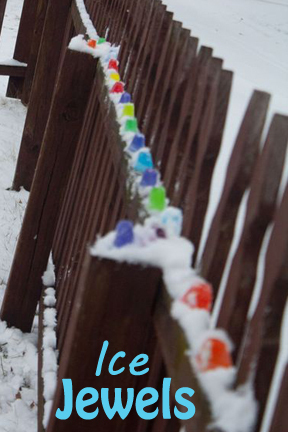 So, I decided to freeze some colored water in ice cubes for the girls to play with in the snow. I could have hidden them a bit for a more of a challenge, but with 2 preschool age kids, I decided just throwing them in the snow would offer enough entertainment. Now, I didn't tell them they were in the snow when we went out to play. The excitement when they discovered what they called "jewels" was adorable. They actually rushed around to see who could collect the most "jewels." It was particularly funny to watch them if they dropped one because it was quickly engulfed by the snow. They had to fumble around and find it and brush all the snow off again all faster then the other one who would also dive for the lost jewel. They each decided to take a side of the fence and line their jewels up on it. They really looked quite pretty against the white snow. 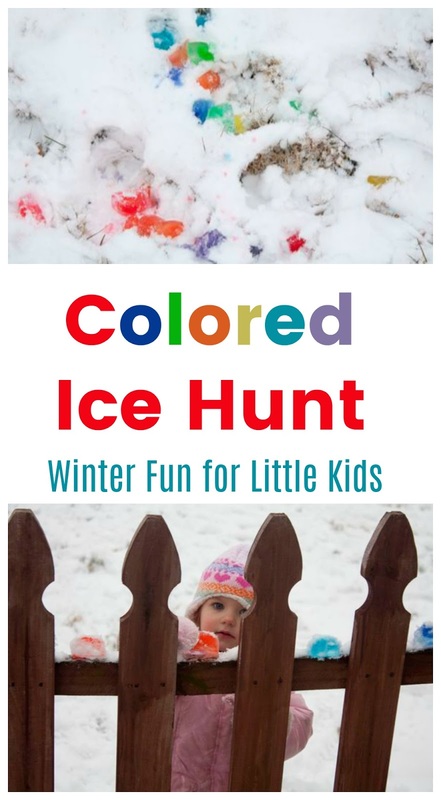 With just three ingredients this is a quick, cheap activity kids can enjoy this winter, and one we will have to repeat!